The Ellicott Steel Toe is an 8-inch tall men's boot with a steel toe that exceeds ASTM F2413-11 and ASTM electrical hazard rated safety standards. It also features 400 grams of 3M™ Thinsulate™ Ultra insulation and Texon® 460 waterproof insoles. Made in the USA with global parts. Best Pair of Boots Ever!! These are hands down the best pair of boots out there. I work heavy construction so i am on my feet all day everyday in every type of condition. These boot hold up no matter what you put them through. I will continue to buy these boots for as long as Chippewa makes them. Going on 20 months. Best boot ever. I wear them 6 days a week and my only complaint is finding a retailer that carries them. Not a fan of online shopping. This is first pair of Chippewa boots I have worn boots my whole life and been through many brands and these boots are the best I had clearly made to last . I started buying Chippewa boots for my husband about 8 years ago. They are a fantastic quality boot that holds up under his rigorous work demands. He never wears anything else. Love them. Wore red wings for years tried danner then switched to Chippewas. 1st pair going on three years of steady abuse and not much maintaince. Decided on buying a new pair and using old as spare. Fit perfect right out of box. Little heavy but knew that. Best work boot out there. The most ill-fitting,heavy and uncomfortable boots that I have ever owned. I did find this boot in my EEE width. Been wearing all day for nearly three weeks hoping that they will "break in".Hasn't happened yet. They just don't feel "right". I finally decided to treat myself to well desrverved big dollar, higher quality work boots.This has been very disappointing.I wont spend my hard earned money on a Chippewa boot again. This is my third set of Chippewaboots, the last two where the Crazy Horse utility boots and I loved them, but always wanted to spend a little more and get these! Well I finally broke down and bought them a few months ago. I drive gas tanker and in all kinds of weather, I love these boots, I keep them looking clean so that I can wear them everywhere. I love Chippewa Boots!! God bless America! I have had good luck with chippewa boots in the past. The low heel boot I purchased are a nice boot. I would be nice if you sold a uninsulated version. 1. This is one of 2 boots that has every special feature that Chippewa offers2. This is the best boot (shoe for that matter) that I've ever worn.I had desired to buy these boots for 3 yrs but life (mission team, move, marriage, 2 kids later) prevented me from getting them. I have just now been in a position to make some purchases and this was the first one. May I say as a large man 6'5 320lbs these boots are a dream to wear. They feel like an old Cadillac (large and comfortable) with incredible ankle support when you lace them right. The fit is great. I always wear a 14 and the E with give enough room for your feet to take a days work, swell up, and still feel just as comfy as when you put them on. The shank is noticeable in the best way possible. I have very shallow stairs, that are about half as long as my foot, while walking up or down I am usually able to only use the ball of my foot the shank in the boot somehow countered that force on the ball of my foot and gave me extra support almost as if the boot was helping me while I was on my toes. I wish I had another pair just sitting around because I know when these give out I will want them again immediately. I've had these boots for 3 years now and they still look and feel like new. took me all winter to break them in, but now they feel like velvety goodness. 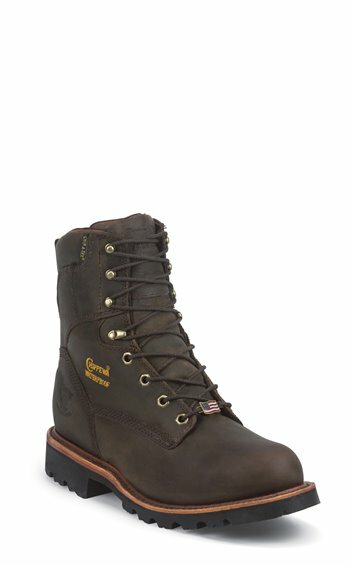 I dont do construction, or work in these boots, but I use them for the harsh new england winter and snow. my feet are always warm and dry. once i get to work ill throw on my nike airs and my feet feel light as a feather compared to these boots! amazing quality. if you need waterproof boots that will last for years, these are the ones you should buy! I bought these a month ago and they are outstanding. Great American made boots that are comfortable, durable, and get the job done. I'm proud to own a pair of these. I've been buying Chippewa for well over ten years. Which means I've only owned three pairs. Most comfortable boot available today, and yesterday. I've done everything from construction, to truck driving in these boots. I now have my second pair. They take a beating from my job but handle it well. Even after the boot got soaked in #6 oil it had plenty of life left. My last pair of boots (also Chippewa) lasted roughly 5 years, and as a trucker who is in and out of the truck constantly and pulling, pushing, and lifting freight all day, my boots are very important to me. One reviewer compared this pair of boots to bedroom slippers, and I couldn't agree more! There was little to no break in process, they feel awesome, and they were on my feet day one right out of the box, and every day since. No lies here, these boots are trouble to break in because they are so well crafted. Once they are broken in, they will last 18 months on river barge decks, which is unheard of. Comfortable, Dependable, incredibly Durable, and worth every penny!! I bought my last pair over 5 years ago. They have finally worn out so I'm replacing them with the same thing. Best boot I've ever owned! I have been wearing these boots for the last 4 1/2 years the same pair of boots. This is just unheard of where I work. I work for the railroad so I'm on ballast a lot and that is not easy on boots. My boots are still comfortable and in the 4 1/2 years they have never leaked. My boots have served there purpose but now it's getting to the point that I need a new pair. I throughly enjoy my Chippewa boots. There's not another work boot that compares. I'm in construction and in the mud,concrete,dirt,and all everyday. I wish I could test them for product durability but I have to pay for them. A little pricey but you get your money's worth. Usually last any where from 1 1/2 to 2 years before needing new pair. Tried the refurbishment plan but was not impressed at all and wouldn't recommend. When wore out buy another pair. I do! So comfortable I find myself even wearing to church on Sunday. Just awesome boots!!! Get yours today and see what I experienced every day. So hurry tomorrow may never come. Dri-Lex® delivers heightened comfort through a moisture management lining system that is totally breathable and quick drying.